During excavations of Jerusalem in 1871, two archaeologists, Clermont and Ganneau, discovered what is known as the Soreg Inscription. Written in Greek, the sign warns non-Jews to keep out of the temple area. It states: "No foreigner is to enter the barriers surrounding the sanctuary. He who is caught will have himself to blame for his death which will follow." "The center of the structure was the tallest, with the front wall being built with beams which sat upon interlocking pillars. Highly glossed stones made up this wall, so finely polished that those who looked upon it for the first time marveled at it in amazement. This was the description of the first structure. Located within it, and nearby, were steps which led up to the second structure, which was surrounded by a stone wall used as a barrier, engraved with an in-scription not allowing foreigners to enter into it under the penalty of death." 'Therefore remember that you, once Gentiles . . . that at that time you were without Christ, being aliens from the commonwealth of Israel and strangers from the covenants of promise, having no hope and without God in the world. But now in Christ Jesus you who once were far off have been brought near by the blood of Christ. For He Himself is our peace, who has made both one, and has broken down the middle wall of separation, . . . that He might reconcile them both to God in one body through the cross, . . . And He came and preached peace to you who were afar off and to those who were near. For through Him we both have access by one Spirit to the Father. Now, therefore, you are no longer strangers and foreigners, but fellow citizens with the saints and members of the household of God, having been built on the foundation of the apostles and prophets, Jesus Christ Himself being the chief corner stone, in whom the whole building, being joined together, grows into a holy temple in the Lord, in whom you also are being built together for a dwelling place of God in the Spirit. 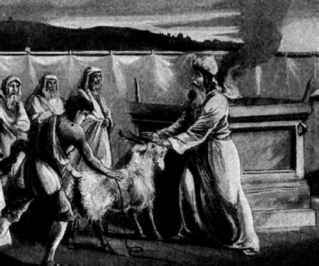 In the Book of Leviticus chapter 16, God instructed Moses and Aaron to select two goats every year for an offering. One was to be used as a sin offering to atone for the sins and transgressions of the people. Once killed, it's blood was to be sprinkled on God's mercy seat on the Ark of the Covenant. There God would view the blood of the sin offering and have Mercy on the people and forgive their sins. The high priest would then lay hands on the second goat which was allowed to live, and he would confess the sins of the people putting them on the head of the goat. The goat would then bear the blame for all the transgressions of the people and would be set free into the wilderness, where God would remember their sins no more. The goat became known as the scapegoat. 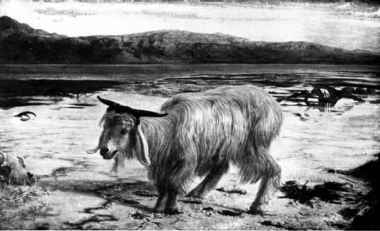 Jewish history records that it was a common practice to tie a red strip of cloth to the scapegoat. The red stripe represented the sin of the people which was atoned for by the red blood on the mercy seat. According to the Jewish Talmuds this red stripe would eventually turn white, signaling God's acceptance of the offering. It's important to note that this event recorded in the Talmuds occurred 40 years before the destruction of the Temple which was destroyed in 70 A.D. The date of this amazing event was 30 A.D., the same year that Jesus offered himself as a sacrifice on the cross. Jesus was the final sin offering and the scapegoat bearing the sins for all mankind. But Christ came as High Priest . . . . Not with the blood of goats and calves, but with His own blood He entered the Most Holy Place once for all, having obtained eternal redemption.
. . . And according to the law almost all things are purified with blood, and without shedding of blood there is no remission. . . . so Christ was offered once to bear the sins of many. To those who eagerly wait for Him He will appear a second time, apart from sin, for salvation. . . . For it is not possible that the blood of bulls and goats could take away sins. . . .
By that will we have been sanctified through the offering of the body of Jesus Christ once for all . . . . this Man, after He had offered one sacrifice for sins forever, sat down at the right hand of God. . . . For by one offering He has perfected forever those who are being sanctified. . . . says the LORD: I will put My laws into their hearts, and in their minds I will write them," then He adds, "Their sins and their lawless deeds I will remember no more." Turning just a few pages into the Bible, we read about the first cities known to man after the global flood of Noah's day. One of Noah's descendants was a man by the name of Nimrod whose kingdom included the cities of Babel, Erech, Akkad, and Calneh in the land of Shinar. And Asshur went forth and built Nineveh, Rehoboth Ir, Calah and Resen in the land of Assyria. These first cities lay in a land modern historians call ancient Mesopotamia which means "the land between two rivers." Those rivers being the Tigris and the Euphrates. This land would later be the staging ground for two of the world's most feared Empires, that of Assyria and Babylon. That same land which we call present day Iraq. I remember during my college days taking a class in Western Civilization and the very first cultures mentioned in the history book we were assigned was that of the ancient Akkadians and Sumerians who lived in Meso-potamia. And it should come as no surprise because the city state of Akkad as well as the cities of Sumer were mentioned in Genesis 10:10-12 long ago. One of the most amazing finds uncovered in Akkad was that of a seal which possibly shows that the Akkadians knew of the story of the temptation of Adam and Eve in the Garden of Eden. George Smith of the British Museum, who lived during the middle 1800's, wrote: "One striking and important specimen of early type in the British Museum has two figures sitting one on each side of a tree, holding out their hands to the fruit, while at the back of one (the woman) is stretched a serpent. We know well that in these early sculptures none of these figures were chance devices, but all represented events or supposed events, and figures ... , thus it is evident that a form of the story of the Fall, similar to that of Genesis, was known from early times in Babylonia." Akkadian "Temptation Seal" From 2,300-2,200 B.C. The first city mentioned in the Bible as being among the cities of Nimrod is Babel. And in fact the city's name as well as the Tower of Babel account is recorded outside of the Bible. 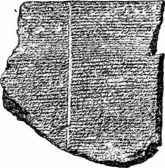 Fragments of an Assyrian tablet were discovered at Nineveh by Austen Henry Layard during the middle of the 18th century that closely parallel the Biblical Tower of Babel account. The artifacts now reside in the British Museum (registration number K.3657) and reads as follows: "his heart was evil against the father of all the gods . . . Babylon was brought into subjection, small and great alike. He confounded their speech . . . their strong palace (tower) all the days they built; to their strong place in the night He completely made an end . . . In His anger His word was poured out . . . to scatter aboard He set his face, He gave this command, and their counsel was confused. .
.He saw them and the earth. . . of stopping not . . . Bitterly they wept at Babi(l)." Sumer's oldest and most important capital city was Uruk (biblical Erech). Present day Iraq possibly derived its name from this ancient city. Uruk is recorded on an artifact known as the 'Sumerian Kings List' which also mentions the Elamites. The very same Elamites who descended from Elam, the son of Shem, the son of Noah as listed in Genesis 10:22. Sumer's capital was later moved from Erech to UR. The same city which Abraham later left to go to the land of Canaan. The Bible calls this city Ur of the Chaldeans in Genesis 11:31. An Inscription from Argistis near Van verifies this title. It states, "This is the spoil of the cities I obtained for the people of the Khaldis (Chaldeans) in one year." On inscriptions found at this ziggurat, Nabonidus states that he had rebuilt the structure which he learned was originally constructed by two kings who lived 1,500 years prior to himself. One inscription also bears the name of another Biblical Babylonian prince by the name of Belshazzar who would live to see God's handwriting on the walls of Babylon as recorded in Daniel chapter 5. 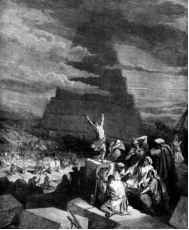 This ziggurat which resembled a four sided stepped pyramid was probably similar to that of the Biblical tower built at Babel. Other towers in Mesopotamia such as the one at Ur have been found at Calah (Nimrud), Assur, Akkad (Sippar), Uruk, Cush (Kish), Borsippa, Aqarquf, Khorabad and Eridu, a city near Ur . Inscriptions from various Babylonian kings also record the construction of these temple towers which they say reached to the sky with similar wording to that found in the Bible's tower of Babel account. Hammurabi, who ruled nearly 2,000 years before Christ, states: "He restored the temple Emeteursag ... and built the temple tower . . .whose top is sky high." Much later in the sixth century B.C. 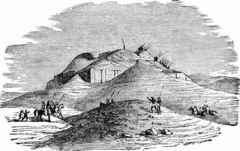 Nebuchadnezzar king of Babylon wrote: "I raised the summit of the Tower of stages at Etemenanki so that its top rivaled the heavens." Archaeology in this region has also uncovered one of the earliest accounts of the flood. It is listed on an artifact known as the Sumerian Kings List dating back to 2,170 B.C. The inscription reads: "The flood swept over (the earth). After the flood had swept over (the earth) (and) when the kingship was lowered (again) from heaven, kingship was (first) at Kish (Cush)." What is interesting about this statement is not only that the flood is the mentioned, but also a city founded by Cush who was the son of Ham, the son of Noah. The Bible in Genesis 10:8 states that Nimrod descended from Cush. The city of Kish (Cush) was located in the area very close to Babylon. Another artifact from the Sumerians was found at Nippur (Biblical Calneh) which states: "A flood came over the cities to destroy the seed of all mankind . . . all the wind-storms, exceedingly powerful attacked as one, At the same time, the flood swept over the culture centers. For seven days and seven nights, the flood had swept over the land. 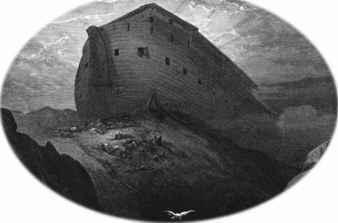 The huge boat had been tossed about by the windstorms on the great waters." "...build a ship, seek thou life . . . aboard the ship take thou the seed of all living things . . . All my family and kin I made go aboard the ship. The beasts of the field, the wild creatures of the field . . . I made go aboard . . ."Board thou ship and batten up thy entrance!" That stated time had arrived: He who orders unease at night, showers down a rain of blight. I watched the appearance of the weather. The weather was awesome to behold. I boarded the ship and battened up the entrance. With the first glow of dawn, a black cloud rose up from the horizon. . . . Consternation over Adad reaches the heavens, Who turned to darkness all that had been light . . . For one day the south storm gathered speed as it blew, overtaking the [people] like a battle. No one can see his fellow . . . Six days and six nights blows the flood winds, as the south-storm sweeps over the land . . . On the seventh day the flood subsided in battle . . . the flood ceased. I looked at the weather; stillness had set in. And all of mankind had returned to clay. . . . On mount Nisir the ship came to a halt. . . . When the seventh day arrived, I set forth a dove. The dove went back and forth, but came back; since no resting place for it was visible. Then I sent forth a swallow. The swallow went forth, but came back; since no resting place for it was visible. Then I sent forth and set free a raven. The raven went forth and, seeing the waters diminished, he eats, circles, caws and turns not around. Then I let out (all) to the four winds and offered a sacrifice. I poured out a libation on the top of the mountains." Another of Nimrod's cities was Calneh which according to the Talmud is associated with the site of Nippur. The name Shinar is found in Egyptian records from Pharaoh Amenhotep II who wrote: "Now when the prince of the land of Naharin, the Prince of Hatti, and the prince of Shinar heard of my great victory, . . . they asked me to spare their lives." To the Northwest of Shinar lies the cities founded by Asshur who was a descendant of Noah's son Shem. His first city was named after himself, Assur. And just like the ruins from Akkad and Sumer, a ziggurat has also been uncovered at Assur. Another one of his cities mentioned in Genesis 10:11 is Calah. The existence of this city has been found on a Royal Inscription from Assur-nasirpal II, an early king of Assyria, who states "I took over again the city of Calah"
historian Xenophon recorded that Larissa was a great fortress located between the cities of Nineveh and Calneh. In the classic movie 'Indiana Jones and the Last Crusade', the actor Sean Connery, the original James Bond, plays Indie's elderly father whose lifetime obsession is to find the Holy Grail. Their quest to find the sacred relic leads them to the ruins of a lost city which was conquered by the crusaders and knights back during medieval times. In order to find the city, the two have to travel by horseback through a winding narrow passageway. The crevice, with towering granite walls skyrocketing upwards on both sides of the canyon, finally opens up onto a spectacular view of a city with its walls and pillars literally carved into the face of the massive rock cliffs that surround the area. This city, which many viewers of the movie are probably unaware of, is the rock fortress of Petra, a major city of the Biblical Edomites. 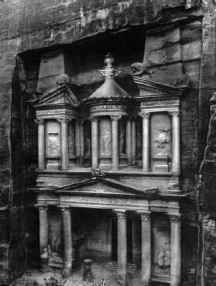 And although in reality the Holy Grail has never been found, the city of Petra remains as one of the greatest discoveries in the annals of biblical archaeology. Not just because of its finding, but because of the prophecy it fulfills and the prophecy that is yet to be fulfilled in the original capital of Edom, Bozrah. Many of the Old Testament prophets spoke out against this once mighty city that was the pride of the nation of Edom. The Edomites were the descendants of Jacob's brother Esau, as mentioned in Genesis 36:43, and they lived in the mountainous regions south of the Dead Sea. According to the Bible, Esau's hand was always against his brother. 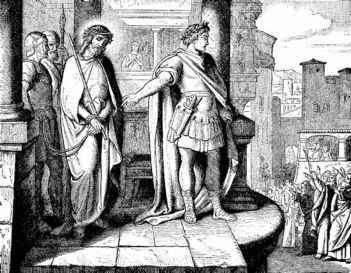 He even plotted once to kill Jacob because he had deceived his father Isaac into giving him a blessing. And later when the children of Israel were seeking safe passage on their way to the promised land, Esau's descendants refused to allow Israel permission to travel through their territory. Because of their constant hostility against Israel, God declared their fate in Malachi 1:2-4: "I have loved you," says the LORD. "Yet you say, 'In what way have You loved us?' Was not Esau Jacob's brother?" Says the LORD. "Yet Jacob I have loved; But Esau I have hated, And laid waste his mountains and his heritage For the jackals of the wilderness." Even though Edom has said, "We have been impoverished, But we will return and build the desolate places," Thus says the LORD of hosts: "They may build, but I will throw down; They shall be called the Territory of Wickedness, And the people against whom the LORD will have indignation forever." Did the Lord lay waste this Edomite stronghold and give it to the jackels? Oh yes. You see from 550 B.C. to 400 B.C. the Edomites were overrun by Nabatean Arabs who ransacked their territory. And although Petra was inhabited by others up until the time the Crusaders conquered it, afterwards the city was completely deserted to the jackals until being rediscovered by archaeologists in the late 1800's. Once a mighty fortress situated on a major trade route between North Africa and Europe. Now all that is left is a bunch of empty stones, a wasteland of thorns and thistles, crawling with snakes, lizards, and owls by night, while birds of prey can be seen circling the sky's overhead by day. "... the owl and the raven shall dwell in it. And He shall stretch out over it. The line of confusion and the stones of emptiness. They shall call its nobles to the kingdom, But none shall be there, and all its princes shall be nothing. And thorns shall come up in its palaces, Nettles and brambles in its fortresses; It shall be a habitation of jackals, A courtyard for ostriches. The wild beasts of the desert shall also meet with the jackals, And the wild goat shall bleat to its companion; Also the night creature shall rest there, And find for herself a place of rest. There the arrow snake shall make her nest and lay eggs And hatch, and gather them under her shadow; There also shall the hawks be gathered, Every one with her mate. "Search from the book of the LORD, and read: Not one of these shall fail; Not one shall lack her mate. For My mouth has commanded it, and His Spirit has gathered them." "For I have sworn by Myself," says the LORD, "that Bozrah shall become a desolation, a reproach, a waste, and a curse. And all its cities shall be perpetual wastes." I have heard a message from the LORD, And an ambassador has been sent to the nations: "Gather together, come against her, And rise up to battle! "For indeed, I will make you small among nations, Despised among men. Your fierceness has deceived you, The pride of your heart, O you who dwell in the clefts of the rock, Who hold the height of the hill! Though you make your nest as high as the eagle, I will bring you down from there," says the LORD. "Edom also shall be an astonishment; Everyone who goes by it will be astonished And will hiss at all its plagues. As in the overthrow of Sodom and Gomorrah and their neighbors," says the LORD, "No one shall remain there, Nor shall a son of man dwell in it. In Ezekiel 25:14, God mentions that the nation of Israel would one day take out the Lord's vengeance on Edom, and history confirms that this prophecy has been fulfilled. "The Idumeans (formerly the Edomites) surrendered to Hycranus who allowed them to live as long as they agreed to circumcise their sons and to abide by Jewish customs. This they did, and from that point on they followed the practices of the Jews." "At the same time the Idumeans, who held some important strongholds, were harassing the Jews; ...Maccabeus and his companions, after public prayers asking God to be their ally, moved quickly against the strongholds of the Idumeans (the Edomites). Attacking vigorously, they gained control of the places, drove back all who manned the walls, and cut down those who opposed them, killing as many as twenty thousand men." The Lord's vengeance against the Edomites was complete, and to this very day the mountains of Seir, Bozrah, Teman and Petra all lie as a barren wasteland in fulfillment of Scripture. But there is still one prophecy given by the Lord about one of Edom's cities, Bozrah, that is still yet to come. It will be fulfilled when Christ returns to this earth in all power and great glory. Isaiah 62:11-63:8: Indeed the LORD has proclaimed To the end of the world: "Say to the daughter of Zion, 'Surely your salvation is coming; Behold, His reward is with Him, And His work before Him.' " And they shall call them The Holy People, The Redeemed of the LORD; And you shall be called Sought Out, A City Not Forsaken. And trampled them in My fury; Their blood is sprinkled upon My garments, And I have stained all My robes. For the day of vengeance is in My heart, And the year of My redeemed has come. I looked, but there was no one to help, And I wondered That there was no one to uphold; Therefore My own arm brought salvation for Me; And My own fury, it sustained Me. I have trodden down the peoples in My anger, Made them drunk in My fury, And brought down their strength to the earth." I will mention the lovingkindnesses of the LORD And the praises of the LORD, According to all that the LORD has bestowed on us, And the great goodness toward the house of Israel, Which He has bestowed on them according to His mercies, According to the multitude of His lovingkindnesses. For He said, "Surely they are My people, Children who will not lie." So He became their Savior." 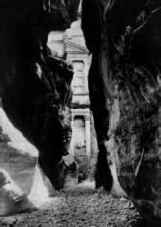 Upon this Rock (Petra) I will build my church, and the gates of hell shall not prevail against it. That word above all earthly powers, No thanks to them, abideth; The Spirit and the gifts are ours Through Him who with us sideth: Let goods and kindred go, This mortal life also; The body they may kill: God's truth abideth still, His kingdom is forever. After Lot fled the city of Sodom, which God destroyed with fire and brimstone because of their sins of homosexuality, he had a son named Ben-Ammi. According to Genesis 19:38 he was the father of the Ammonites. The Ammonites became one of Israel's most hated enemies. They were one of the nations that hired Balaam to curse Israel at the time of Moses, as recorded in Nehemiah 13:1-2. Because of that action, God declared in Deuteronomy 23:3 that no Ammonite could ever enter into the assembly of the Lord. Biblical archaeology has brought to light many artifacts from the kings of Ammon. One such seal is found impressed with the words: "Milqom, the steward of Baalis." 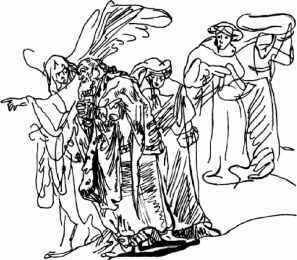 "Moreover Johanan the son of Kareah and all the captains of the forces that were in the fields came to Gedaliah at Mizpah, and said to him, "Do you certainly know that Baalis the king of the Ammonites has sent Ishmael the son of Nethaniah to murder you?" But Gedaliah the son of Ahikam did not believe them." Gedaliah's seal has also been unearthed in archaeology. A mention of the Ammonite's was also found on a bronze bottle near Amman Jordan. The relic belonged to Amminadab the first, the king of the Ammonites (650 B.C.) It is engraved with the words "The Sons of Ammon." "To strengthen his forces he was assisted by Hadazer of Damascus who had 1,200 chariots and cavalrymen, along with 20,000 soldiers on foot . . . 2,000 chariots and 10,000 troops of Ahab from Israel . . . military forces of Basa, the son of Ruhubi, the Ammonite. Combined they numbered twelve kings." Inscription mentioning Ahab of Israel and the king of Ammon.